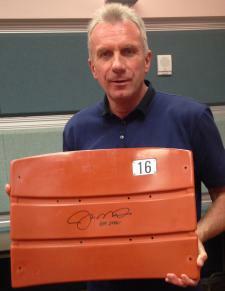 Joe Montana Autographed Candlestick Park Seatback #16 with "HOF 2000" | Sports Memorabilia! THIS SALE IS FOR A LIMITED TIME ONLY! A GREAT DEAL WTIH THE SPECIAL INSCRIPTION INCLUDED! 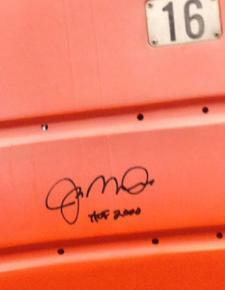 This Autographed Joe Montana Seatback from Candlestick Park has been signed with the inscription "HOF 2000." With the demolition of Candlestick Park Joe Montana secured all the available #16 seatbacks and had them delivered to National Sports Distributors. 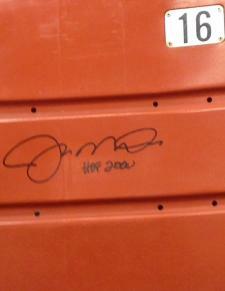 Each seatback has been autographed in black. Originally available in two colors, brown and orange, all the brown seatbacks with HOF 2000 are sold. Only the orange is currently available. The Candlestick Park seats have changed color over their years of exposure to the outside elements. Many of the orange seatbacks changed to the brown color and many of the seatbacks, especially the orange color have oxidized which provides a white color on top of the seatbacks. The amount of oxidation varies from very little to over half of the seatback. This oxidation provides that "game used" look! The Joe Montana hologram and the National Sports Distributors (NSD) numbered hologram will be on each Autographed Joe Montana Seatback. The NSD hologram is the best in the industry as it guarantees that the autograph was witnessed by NSD at the signing. 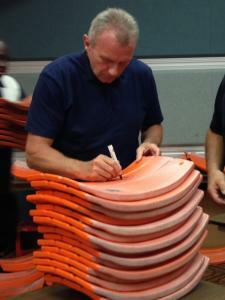 Every Autographed Joe Montana Seatback was signed at National Sports Distributors' private signing. 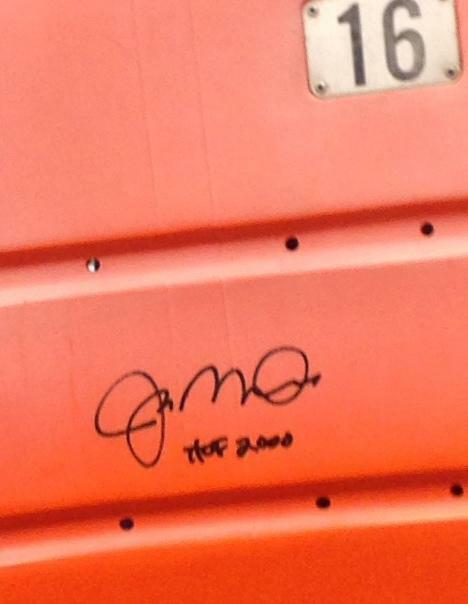 A Certificate of Authenticity that matches the numbered NSD hologram is also provided with each autographed Joe Montana seatback.The number of available #16 Candlestick Park seatbacks is limited. Once these #16 seatbacks are all sold no more seatbacks that were part of Candlestick Park will be available. This is a rare opportunity to get one of these great collectibles. In addition, Joe Montana will not be autographing any seatbacks at any public event or card show. Click here Candlestick Park Seatbacks to see all the autographed seatbacks available by Joe Montana, Jerry Rice, Steve Young and Dwight Clark along with some AWESOME Display Cases for the seatbacks! $15.95 shipping/handling per seatback going to CA, WA, OR, NV or AZ. $7.00 will be added to this shipping fee (but not reflected in your shopping cart) for all seatbacks going to the other states excluding Hawaii and Alaska. For these two states the shipping will be slightly more.